Finally, players take turns activating one of the building tiles they own to gain the benefit shown on the tile. Each building can only be activated once per round (even if there are several different possible benefits) and only the building’s owner can activate it. Some buildings generate cash, some generate VPs, some generate yellow (goods) cubes which can be used to activate other buildings. Also, some buildings increase the benefits of neighbouring buildings, etc. So, there’s lots of variety in the buildings and their benefits and you’re always looking for the best combination to deliver the most VPs, cash, etc. and to deliver the ones you currently need (cash versus VPs). The trickiest part is that activating most tiles require amounts of power and/or water – represented by red/blue cubes located on the power/water plant tiles. Power/water cubes are limited in number, plus the cubes must be transported from the plant tiles to the tile being activated. Players must pay $2 for each cube to whoever owns the generating plant tile, plus $2 per cube for each tile each cube crosses (to the tile owner). So, using cubes from your own plants and transporting across your own tiles is free; however, any player can use any cubes so you can’t rely on cubes in your plants being available for your own use. When all players have activated all the tiles they can/wish, the round ends and all the cubes on tiles are removed. Any power/water plants that generate power/water each round (depends on what was built) have any relevant cubes added to them. Overall, City Tycoon offers a continuous supply of interesting choices and almost no down time. As you’d expect, you must decide what tiles you take and then build (which are affordable, give value for money, and give benefits that could combine and balance well, etc.) 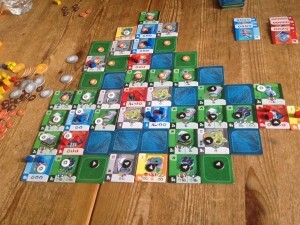 Plus, you also need to consider which tiles to sell, and where to build too. However, there’re lots more to consider. When placing tiles, you’re always thinking about the resources they will need and who else may want those resources – sometimes, you build in a location just to stop another player doing so. There are lots of elements to balance such as generating cash versus generating VPs. Do you build a large contiguous area of your own versus building near others? Do you build power/water plants far away from other players’ tiles but risking no-one buying any spares because they’re expensive? The activation phase is the tensest part of the game as you wait to see what other players do and how that affects your plans. You need to think carefully about what tiles you activate, and in what order, but you also need to consider what other players will do too. It’s good to own buildings that don’t rely on only one type of resource and leave you options if the resources you wanted aren’t available. You may have tiles you want to activate in order (i.e. generate a yellow cube, then activate a building using that yellow cube), but what do you do if someone makes generating the yellow cube difficult or impossible? Sometimes it’s worth paying money to use a power/water cube from a plant instead of a cheaper option because it makes the remaining cubes more expensive for an opponent. Just using (or threatening to use) a single cube can upset an opponent’s plans. I built one building tile to try to scare an opponent into using water cubes from a nearby plant before I did, but I was actually just trying to ensure he didn’t use other cubes near my other buildings. You always need to keep watch for what other players may do – I think we were all surprised to find how often the cubes we thought we’d get to use were taken before we had a chance. It added some excellent tension. In our game there were few power/water plants but this just made resources scarce for everyone which felt even. Activating a building that needed lots of cubes with a relatively poor return was worthwhile because it meant there were fewer cubes for others to use. The only downside I found to the game was that it wasn’t immediately clear at a glance who owned which tiles. Card counters are used to mark the tiles but the different coloured building types and the coloured power/water cubes mean that the card counter colours (which are orange, black, white, etc.) are a bit lost. A simple solution would be coloured wooden discs in strong colours instead of the card discs – a more complex solution would be coloured card frames that go around each tile but could be fiddly and adds production cost. It’s not really a big problem but it sometimes takes a moment to see which players are where and what threats there may be to your position/plan. In the end, I really enjoyed City Tycoon. It offered a tense game with lots of good decisions and scope to annoy other players, plus it did so in a relatively short time too. Players prone to analysis paralysis may implode with the amount to consider so will probably need prodding with a sharp stick. We played with 3 players which was a fairly civil affair but there were still many humourous times (well, humourous if you weren’t the player affected) when a player would use a cube someone else had been relying on. With 5 players, I can imagine it being a bloodbath and I look forwards to a game of that. 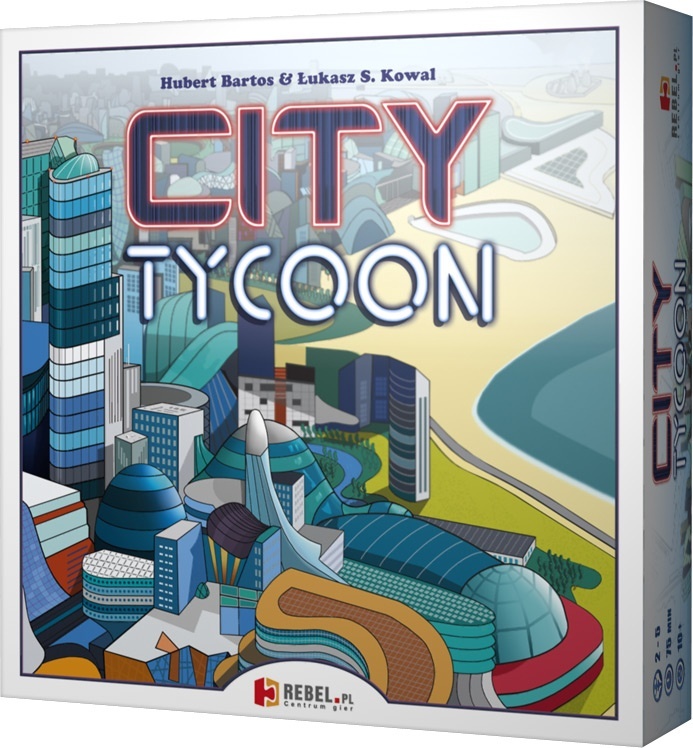 This entry was posted on Thursday, July 11th, 2013 at 4:27 pm	and is filed under Board Game Review, Board Games, City Tycoon, Essen Spiel 12. You can follow any responses to this entry through the RSS 2.0 feed. You can leave a response, or trackback from your own site.